PM #40762529 $5.00 • Vol. 29, No. 23 July 9, 2018 L AW TIMES C O V E R I N G O N T A R I O ' S L E G A L S C E N E • W W W . L A W T I M E S N E W S . C O M Lawyers voice concerns about biometrics expansion Brian Dingle says the requirement for biometric information from travellers coming to Canada will impact some of his clients. Photo: Robin Kuniski IMPAIRED DRIVING Stricter laws may impact immigrants P5 CAPITAL PUNISHMENT Serious crimes part of Canadian history P7 FOCUS ON Criminal Law P10 BY DALE SMITH For Law Times O n July 31, the Canadian government will re- quire biometric infor- mation from travellers to the country from Europe, the Middle East and Africa. Travellers from Asia, the Asia Pacific and the Americas will be required to give the information starting Dec. 31. Lawyers say this can create delays for those coming into Canada on business and there are potential privacy concerns for clients as the information is being shared with four other partner countries. On- tario lawyers need to be aware that the new requirements will alter the way in which people are able to ar- rive in Canada, they say. The new biometric require- ments will apply to anyone ap- plying for a visitor visa, a work or study permit (excluding U.S. na- tionals), permanent residence or refugee or asylum status. There will be exemptions for visa-exempt nationals entering Canada as tour- ists who hold a valid Electronic Travel Authorization, children under the age of 14, people over the age of 79, U.S. visa holders transit- ing through Canada or those who have already provided biometrics for a refugee claim or application for a study or work permit. Biometric data is valid for 10 years once submitted. Brian Dingle, partner in the business immigration group in the Toronto office of Borden Lad- ner Gervais LLP and the firm's na- tional business immigration focus group leader, says the changes will have an impact on his clients who work in film and television and could cause delays. "If you're used to simply show- ing up in Canada and applying for a work permit, and if biometrics screening is down, you're sitting there until biometrics go back up," says Dingle. "It's been framed in a friendly way that it's going to make legitimate travel easier while pro- tecting national security, but it's a big change from what we're used to." Dingle notes that the United States has had similar measures for some time, but it remains unclear how the new biometrics program is going to play out, particularly given how many problems the Canadian government had when rolling out the eTAs in 2015 and 2016. 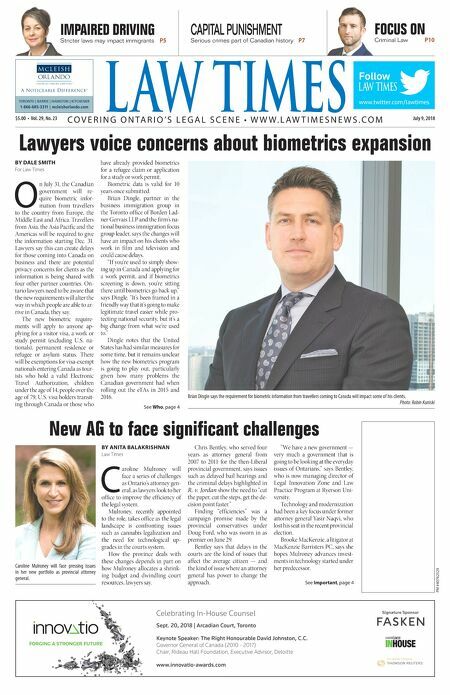 See Who, page 4 New AG to face significant challenges BY ANITA BALAKRISHNAN Law Times C aroline Mulroney will face a series of challenges as Ontario's attorney gen- eral, as lawyers look to her office to improve the efficiency of the legal system. Mulroney, recently appointed to the role, takes office as the legal landscape is confronting issues such as cannabis legalization and the need for technological up- grades in the courts system. How the province deals with these changes depends in part on how Mulroney allocates a shrink- ing budget and dwindling court resources, lawyers say. Chris Bentley, who served four years as attorney general from 2007 to 2011 for the then-Liberal provincial government, says issues such as delayed bail hearings and the criminal delays highlighted in R. v. Jordan show the need to "cut the paper, cut the steps, get the de- cision point faster." Finding "efficiencies" was a campaign promise made by the provincial conservatives under Doug Ford, who was sworn in as premier on June 29. Bentley says that delays in the courts are the kind of issues that affect the average citizen — and the kind of issue where an attorney general has power to change the approach. "We have a new government — very much a government that is going to be looking at the everyday issues of Ontarians," says Bentley, who is now managing director of Legal Innovation Zone and Law Practice Program at Ryerson Uni- versity. Technology and modernization had been a key focus under former attorney general Yasir Naqvi, who lost his seat in the recent provincial election. Brooke MacKenzie, a litigator at MacKenzie Barristers PC, says she hopes Mulroney advances invest- ments in technology started under her predecessor. See Important, page 4 www.twitter.com/lawtimes Follow TORONTO | BARRIE | HAMILTON | KITCHENER 1-866-685-3311 | mcleishorlando.com cLeish Orlando_LT_Jan_20_14.indd 1 14-01-15 3:15 PM Celebrating In-House Counsel Sept. 20, 2018 | Arcadian Court, Toronto Keynote Speaker: The Right Honourable David Johnston, C.C. Governor General of Canada (2010 - 2017) Chair, Rideau Hall Foundation, Executive Advisor, Deloitte FORGING A STRONGER FUTURE www.innovatio-awards.com Signature Sponsor Untitled-2 1 2018-07-04 10:26 AM Caroline Mulroney will face pressing issues in her new portfolio as provincial attorney general.